Red Rock Canyon NCA, managed by the Bureau of Land Management (BLM), is located 10 miles west of Las Vegas, Nevada. This 197,000 acre area provides a 13-mile scenic drive, more than 30 miles of hiking trails, picnic areas, and visitor center with exhibit rooms and a book store. Bicycles are permitted only on designated roads and trails. RIDING CROSS-COUNTRY OR ON UNDESIGNATED TRAILS IS PROHIBITED. Use good cycling sense when riding: wear a helmet and brightly colored clothing, obey traffic laws, carry water, and be aware that automobile drivers may be distracted by the scenery. Traffic is heaviest between 10:00 a.m. and 3:00 p.m. Ride defensively! Permits are available by calling (702) 515-5050 for overnight use, and late exit. Placement of new fixed anchors during climbs are illegal within the conservation area. Please use "Leave No Trace Principles." Within the Red Rock Canyon NCA, call 293-8998 or 911. Emergency phones are located along scenic loop at Sandstone Quarry, White Rock, Ice Box Canyon, and Pine Creek. Fires are permitted in camp stoves or in provided grills in designated areas only. Fires are prohibited in the backcountry. Also, due to current fire restrictions the following are prohibited: campfires, use of charcoal, and smoking outside of vehicles. Keep fires small and controlled. Collection of wood, including dead or down, is prohibited. Activity schedules for naturalist-guided walks, programs, and talks are posted at the visitor center which is open from 8:00 a.m. to 4:30 p.m. daily during the Winter (November through March) and 8:00 a.m. to 5:30 p.m. daily during the Summer (April through October). Call (702) 515-5367. Scheduled curriculum-based activities are presented on and off site. Current special programs going on are Astronomy and Desert Babies. Monthly programs including nature walks, hikes, kids activities and evening programs can be found on the Red Rock Canyon Interpretive Association web site. Lost items should be reported or taken to the visitor center. Pets should be leashed (six foot maximum) and in your physical control at all times. They are prohibited in buildings (except service dogs). Never leave your pet in a closed vehicle. Temperatures can soar to over 120 � F (49 � C) in minutes. Your pet can die of heatstroke under these conditions. Picnic areas are located at Willow Spring (along the scenic drive) and at Red Spring (in the Calico Basin area). Both picnic areas have tables, barbecue grills, and toilets. Drinking water is available only at the visitor center. Due to a major construction project, the picnic area at Red Springs is closed until further notice. Due to current fire restrictions the following are prohibited: campfires, use of charcoal, and smoking outside of vehicles. The 13-mile scenic drive is a one-way road. Bicycles are permitted to ride on the scenic drive, must obey traffic laws. Sightseeing, photography, and hiking trails are accessible from the designated pullouts and parking areas. The scenic drive is open daily from 6:00 a.m. to 5:00 p.m. in the Winter (November through February); 6:00 a.m. to 8:00 p.m. in the Summer (April through September); and from 6:00 a.m. to 7:00 p.m. in the Spring (March) and Fall (October). Show courtesy towards cyclists and pedestrians. Treat bicycles as you would another car. Drive only on established roadways and park only in designated areas. Watch for rocks or other debris on the roadway. Report all accidents to a ranger or to the visitor center. 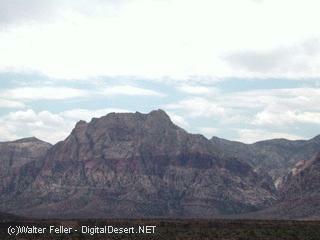 All terrain vehicles (ATV's) and unlicensed vehicles are not permitted at Red Rock Canyon NCA.